Barkan winery was born at the end of the 19th century. Its current incarnation is a wine paradise. So how did we do that? It was actually simple. From the very first days of our existence, we have concentrated our attention on one thing only: grapes' quality. The top-grade breeds were brought from all over the world and put in Barkan vineyards in Israel. Nowadays, there are dozens of breeds occupying a grand total of over 10 square kilometers of vineyards in winery's possession, while every breed is grown in an area suitable for itIn 2000, a new sophisticated winery was established at Hulda kibbutz located in the Judean plain. The winery was designed with 21st century in mind. It boasts the most advanced production technologies in the world. The winery includes laboratories, farms, the packaging center, and the marketing & logistics center. 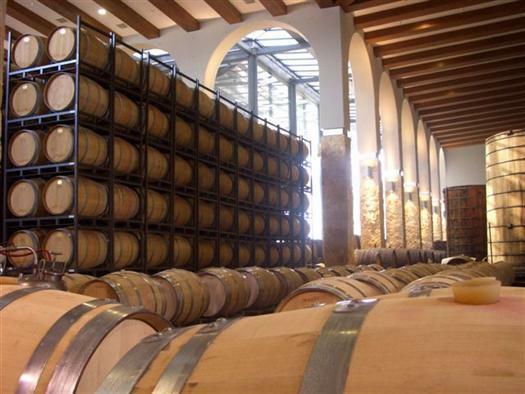 Thanks to the enormous assortment of wine breeds and growth areas, the advanced fermentation methods, as well as over 5,000 natural oak barrels, Barkan winery is a real wine paradise. Barkan winemakers have gained world-wide renown and won prestigious awards due to the exceptional wine quality and the brave grape breed combinations. You are invited to taste our wine yourselves. Feel the power behind every drop. Cheers! "The grapes used to produce this exceptional Merlot were hand selected from Barkan's vineyards located in the northern Galil region. This Merlot has a deep ruby color with an extremely rich and full character. With its bouquet of ripe cherries, fresh peppers, and velvety soft tannins." Barkan Classic Pinot Noir offers strawberry aromas with hints of black cherries and mint. "With an abundance of fruit aromas, the wine is produced from 100% Petite Syrah grapes from the vineyards of the Barkan Winery in the Judean Plains. The aromas which create a deep and full flavor, make this an exceptional wine." Barkan Chardonnay 2014 is harvested by hand from vineyard in the center of Israel. This Kosher white offers aromas of blueberries, guava and pears on the nose. On the palate, balanced flavors with good structure and a long, lingering finish.